« What Smart Home Features Benefit You During the Winter? Universal remotes can make your life easier but there are a few things you need to know. Universal remotes are key in making your life easier. Rather than having 6 or 7 remotes to control each aspect of your home theater laying around, pair it down to just a few or even one single remote that can control the function of everything. Universal remotes use different codes to communicate with all of the gadgets in your home theater or living room, but they can nonetheless sometimes be confusing. Let’s take a look at the basics of universal remotes. Some kinds of universal remotes are capable of learning and mimicking the signals from an existing remote. These are the most flexible kinds of universal remotes, capable of working on far more devices. That said, you do have to “teach” them how to do certain things, so they require a fair bit more amount of work. Each function needs to be bound to a certain key which can take a good deal of time. However, they’re definitely the best option if you have a lot of smart devices in your home that all need to be controlled. Pre-programmed universal remotes are older than their learning counterparts. Typically, they’re cheaper and have much less flair to their design. They can only operate with major brands and usually only work for between four to twelve electronic devices. Some of these pre-programmed remotes have an auto-program feature that can find the right codes for each device you have. Otherwise, you need to manually add each code in for it to work. Which Universal Remotes Are Right For You? 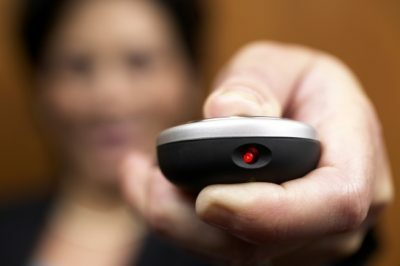 Many remotes these days come with additional features, such as an actual user interface or PC connectivity. These are great for smart home owners who may need more nuanced abilities when it comes to their remote control needs. Just make sure whatever remote you purchase is able to pair up with all your devices and you’ll be good to go! This entry was posted on Friday, January 26th, 2018	at 3:21 pm	and is filed under Home Theater System	. You can follow any responses to this entry through the RSS 2.0	feed. Both comments and pings are currently closed.